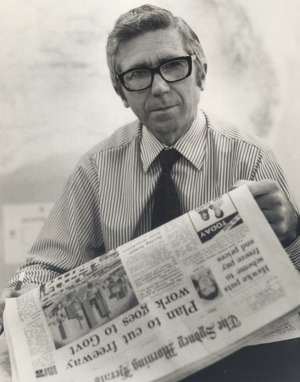 Alan Dobbyn’s career as a newspaper journalist encompassed some, though not all, of the golden age of journalism, when newspapers were the primary source of news and the metropolitan morning newspaper hitting the streets each morning set the agenda for the day. The Sydney Morning Herald, to which Dobbyn gave 34 years of his life, was at the beginning like a great ship sailing untroubled into the future, prosperous, seemingly unchallengeable, staid, conservative and gentlemanly. Dobbyn, who started as a teenage proof-reader on a regional newspaper, epitomised this. During his service from 1954 till 1988, he was news editor and bureau chief for John Fairfax and Sons Ltd in both New York and London. He was dedicated, reflective and tough, and moderated everything with a quiet sense of humour. In 1987, the takeover of Fairfax in a leveraged buyout by Warwick Fairfax swelled the assets of the company pension fund, and Dobbyn and a number of his colleagues opted to retire. He and Daphne returned to Australia in 1988. In 1997, the couple moved to Stroud, north of Newcastle, settled on a hill overlooking the town and threw themselves into helping to preserve the unique collection of Georgian buildings in the town, a legacy of the first venture by the Australian Agricultural Company, including St John’s Anglican Church, built in 1833 as the company’s chapel. Dobbyn’s legacy includes the Stroud Heritage Conservation Trust, which helps fund the restoration of these structures under the patronage of Professor The Hon. Dame Marie Bashir AC CVO and Mr John B. Fairfax AO. Alan Dobbyn is survived by Daphne, children Tim, who followed him into journalism and worked for Reuters in the United States, Luke, who pursued a banking career, Anna, who became a doctor, his brother, William, and six grandchildren. The funeral will be at St Peter’s Anglican Church, Cremorne, on Tuesday, April 21, at 11.30 am, followed by a wake.